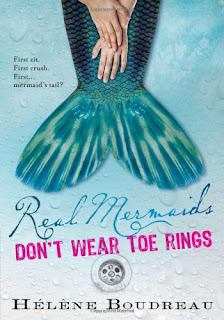 My Thoughts: Real Mermaids was a purely cute read! We are introduced to Jade who is 13 years old. She has a best friend named Cori who she likes to share everything with. She lives with her dad. Her mom died a year ago and she's been missing her ever since. Jade likes a boy named Luke. This is a somewhat new crush. He comes back into town after being away for a while. The thing is, he used to make fun of her for a while, or at least she thought so, calling her scissor lips. He comes back with nice hair, a killer tan, and really cute. Jade gets her first period and its quite a funny situation. If I was in Jade's position and didn’t know much about what would happen, I would have been really nervous and embarrassed too! One night while Jade is in the bathtub she falls asleep and wakes up with a tail. What is going on? Is she a mermaid? Read the book to find out! Overall: This was a cute book. It didn't have much real depth to it. Just a sweet read. It felt more like a tween book than teen. No real substance to it besides just the fun factor. Still a cute read though. I liked Luke, I liked Cori, I liked the storyline. I'll definitely read the next book in the series though! Cover: Like it. Love the colors and its actually really cute. Sounds like a cute read. I've been finding a lot of these books being marketed as YA when they should be for tweens. Slightly frustrating. This is not something I would typically pick up if I saw it in the bookstore. It sounds like a cute read though, and sometimes I need something that is just cute and easy! It seems like you are in a lighter contemporary mood since that is mostly what you have read recently. I'm sorry this one didn't fully come together for you. I think I'll probably just pass this one up like I have done for the past year. Tween or middle grade books aren't exactly my thing, but this one sounds really cute! I haven't read any mermaid books lately, so I suppose I should give this book a shot. aww this sounds like it'll be more middle grade than YA, might recommend it to my cousin! I actually have this book too, that I won from a giveaway and it seems cute. Sounds very cute. Can see my girls reading this.